As executive director, Seroka is responsible for managing a more than $1 billion budget, advancing major capital projects, growing trade volumes and promoting innovative, sustainable practices that strengthen the region’s economy. 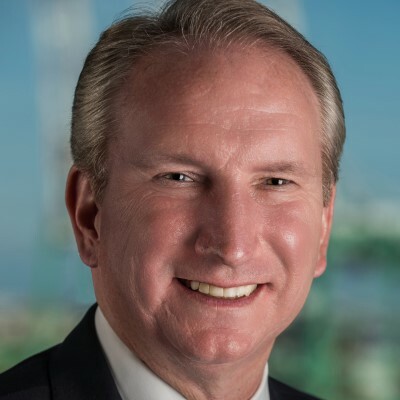 His duties involve interacting with a wide range of stakeholders, including Port customers around the globe, industry partners, elected and appointed officials at all levels, harbor area residents and business leaders. He has been appointed to the following national committees at the federal level to enhance the speed and efficiency of cargo movement and supply chain optimization: U.S. Department of Commerce Advisory Committee on Supply Chain Competitiveness; U.S. Department of Transportation Bureau of Transportation Port Performance Freight Statistics Working Group; U.S. Maritime Administration Marine Transportation System National Advisory Committee; and Federal Maritime Commission Supply Chain Innovation Team. Seroka brings more than 30 years of experience in shipping, global logistics and executive management. After several key overseas positions for American President Lines (APL) Limited, he returned to the U.S. in 2010 to become President – Americas in Phoenix where he managed APL’s Liner Shipping business and was responsible for all commercial, port terminal, intermodal, land transportation and labor activities throughout the region. Seroka joined APL in 1988 as a sales support representative in the company’s Cincinnati office after earning an MBA and Bachelor of Science in marketing from the University of New Orleans. Over the years, he has held various positions in sales and management with increasing responsibility and high-level assignments all over the world.